Dr. Leong is a physiotherapist and specialized in the prevention and management of shoulder disorders and tendon pathologies. She obtained her PhD from the Department of Rehabilitation Sciences, The Hong Kong Polytechnic University in 2016. After her postgraduate studies, she then pursued further postdoctoral training in La Trobe Sport and Exercise Medicine Research Centre, La Trobe University, Australia, where she gained extensive experience in the management of tendinopathy. She then continued her postdoctoral training in the Department of Orthopaedics and Traumatology, The Chinese University of Hong Kong, and promoted to Research Assistant Professor since 2018. Dr. Leong has a strong research record in publishing articles in international journals and delivering seminars in both local and international conferences. She is currently a Member of the Editorial Board for the Asia-Pacific Journal of Sports Medicine, Arthroscopy, Rehabilitation and Technology (AP-SMART). 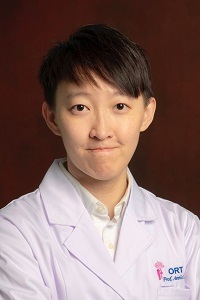 In recognition of her research, she won the Faculty Distinguished Thesis Award from the Faculty of Health and Social Sciences, The Hong Kong Polytechnic University in 2016; and the Silver Best Paper Award in the Sports Chapter from the Hong Kong Orthopedic Association in 2018. Her current research areas focuses on ultrasound imaging of muscle and tendon, biomechanics and neuromuscular control of the shoulder and scapula, and the prevention and management of rotator cuff tendinopathy. Leong HT*, Fu SN (2018). The effects of rigid scapular taping on the subacromial space in athletes with and without rotator cuff tendinopathy: a randomized-controlled study. Journal of Sport Rehabilitation, doi: 10.1123/jsr.2017-0287. Leong HT*, Fu SC, He X, Yung SHP (2018). Risk factors associated with rotator cuff tendinopathy: a systematic review and meta-analysis. Asia-Pacific Journal of Sports Medicine, Arthroscopy, Rehabilitation and Technology, 13: 17-18. Leong HT*, Ng GF, Fu SN (2017). Effects of scapular taping on the activity onset of scapular muscles and the scapular kinematics in volleyball players with rotator cuff tendinopathy. Journal of Science and Medicine in Sports, 20(6), 555-560. Leong HT*, Ng GY, Chan SC, Fu SN (2017). Rotator cuff tendinopathy alters the muscle activity onset and kinematics of scapula. Journal of Electromyography and Kinesiology, 25, 40-46. Tsui SS, Leong HT*, Leung VY, Ying M, Fu SN (2017). Tendon vascularity in overhead athletes with subacromial pain syndrome and its correlation with the resting subacromial space. Journal of Shoulder Elbow Surgery, 26(5), 774-780. Leong HT*, Tsui SSM, GYF Ng, Fu SN (2016). Reduction of the subacromial space in athletes with and without rotator cuff tendinopathy and its association with the strength of scapular muscles. Journal of Science and Medicine in Sports, 19(12), 970-974. Leong HT*, Hug F, Fu SN (2016). Increased Upper Trapezius Muscle Stiffness in Overhead Athletes with Rotator Cuff Tendinopathy. PLoS ONE. 2016, 11(5), e0155187. Leong HT*, Ng GY, Leung VY, Fu SN (2013). Quantitative estimation of muscle shear elastic modulus of the upper trapezius with Supersonic shear imaging during arm positioning. PLoS ONE, 8(6), e67199. Leong HT*, Tsui S, Ying M, Leung VY, Fu SN (2012). Ultrasound measurements on acromiohumeral distance and supraspinatus tendon thickness: test-retest reliability and correlations with shoulder rotational strengths. Journal of Science and Medicine in Sports, 15(4), 284-291.